Learn how to unlock your hidden powers, and live a more meaningful life. For years, this ancient knowledge has been kept a secret. It is now time to unveil the techniques and practices that will unleash your true power. This book is a wonderful resource as it is.. Discover how you can unleash your potential and unlock your full power through guided meditation techniques. Learn about Kundalini, chakras, Prana, and more and how to use them to realize your higher capabilities. Discover how to unleash your psychic abilities, intuition, clairvoyance, and awaken your Kundalini. 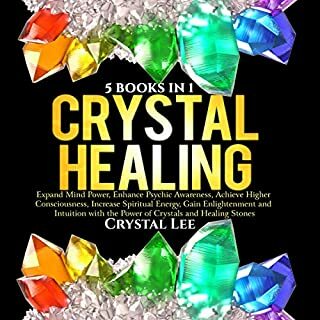 This book will enrich your spirituality and increase your psychic senses, unveiling secrets that will allow you to create positive changes in your life. I have developed a healthier spiritual part of me. Kundalini Awakening: Heal Your Body Through Guided Self Realization, Divine Energy, Expand Mind Power, Clairvoyance, Astral Travel, Intuition, Achieve Higher Consciousness, Awaken Your Energetic Potential will give you all of the insight you need to awaken your Kundalini energy, balance it, and explore life post-awakening. In this comprehensive guide, you will discover important insight on the background of Kundalini energy, including where it began and what it is referencing. You will also receive valuable advice from Kundalini gurus and masters, tips on how you can awaken Kundalini further, and practices you should use to invoke your awakening. Get your copy of Kundalini Awakening today! Anyone who wants to go inside his own self and achieve enlightenment through the path of Kundalini then this is the book to turn to. This is such a complete guide to Kundalini awakening. This explaining exactly what it is, where it comes from, how you recognise it, the practices that bring it about and many more! I highly recommend this audiobook! This is a well-researched audiobook guide and would love to recommend this for anyone who is serious about the pursuit of awakening your Kundalini. If you are curious about meditation, chakras and the releasing spiritual energy then this book is for you. The book speaks to the history of Kundalini and gives ancient wisdom on both the positives and negatives of unlocking it's potential. The book is broken down into chapters which includes simple techniques that appear to be easy to follow. This audiobook is a simple, easy-to-follow guide that will help you to understand not only the roots of Kundalini. There are simple, yet effective, techniques for helping you strengthen your Kundalini when it is time for you to awaken this dormant energy; effective strategies for when your Kundalini has been awakened too early; its relationship with other alternative therapies including the ancient Chinese philosophy of Chi; and even what to do when your Kundalini has been activated. I absolutely loved this audiobook. I've been working through it. Jenifer Williams offers so many ways to bring balance into your life, and his work is very easy to comprehend. You will definitely find true happiness and peace after listening this audiobook. I definitely recommend this for anyone who is interested in kundalini awakening. This has wide information of the subject matter. A Kundalini Awakening is a life changing experience that can bring tremendous healing and bliss. The book is well written, researched as well as it was well narrated. This goes into the origins of Kundalini and how it can benefit anyone at any time or place in life. If you're looking for a solution or a goal in your spiritual journey - Kundalini is for you! I recommend this if you're a beginner especially.. I recommend this if you're a beginner especially for someone like me who is just starting learning about kundalini. This contains what Kundlini is, and also fom the different types of kundalini, its history and the good and bad differences. This audiobook has it all, It doesn't go on telling us that its 100% proven and back up by science. I found this audiobook very helpful and an eye opener on more that we can learn about ourselves, minds, and spirits. If you are new to this subject and find yourself listening to this. This audiobook serves as a complete guide in handling Kundalini so having a copy is completely helpful. I had a better understanding of Kundalini when I listen to his book and also it gave me a whole new understanding as to how important Kundalini is. I am grateful that I found this wonderful book that it taught me another concept that can help me live a life full of beautiful energy that will last a long long time. Also, I am very thankful that my cousin introduced this book to me. This was my first real introduction to Kundalini, and it was a really great guide and overview on the topic. It gives the history for context and then helps you know how this can be put to work in your own life. It was a very interesting audiobook that definitely makes you understand the whys and hows of Kundalini! I would recommend this for anyone with a beginner to moderate level of knowledge and experience with Kundalini. This audiobook is entirely persuading! This audiobook is entirely persuading! I admire it because this book has given me the best exhortation and knowledge so far on what the Kundalini is and what would i be able to do to help myself. Despite the fact that I don't have plans to experiment with my Kundalini, the instructions and steps in here are point by point and everybody who are entranced with the idea can tailor it effectively. Liked it very much! Perfect for a person seeking a spiritual path that is alternative to the usual religious dogmas. If you already practice yoga and meditation and want to bring it to a whole new level, this could be it? Just take this with caution and seriousness. This book will take you on an exciting introductory journey to unlocking your secret spiritual power. This was a great help in understanding Kundalini, what it could do and how it could be done. Kundalini is great when understood and learned to be able to unleash the inner spiritual power within us. This audiobook has helped me become guided on what to do to gain such enlightenment. I will make sure that this not just come pass without having experienced the things that this book has mentioned. I am eager to apply and practice the things that I've learned from this audiobook and make sure that I will get on the path to being healthier and happier. The Divine Energy Of Kundalini. Awakening Kundalini brings forth the deeper wisdom of the meditative practice, and helps us to open the disparate aspects of ourselves into a compassionate and unified whole within the divine. 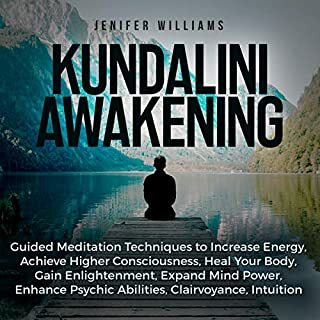 The author 'Jenifer Williams' speaks with great clarity about how the kundalini works, how it unfolds, how to prepare yourself for that unfolding, and what to expect on the journey of Kundalini awakening. And for me, this is a real treasure because it is both filled with incredibly clear explanations, and the divine energy of kundalini. This book 'Kundalini Awakening: Heal Your Body Through Guided Self Realization, Divine Energy, Expand Mind Power, Clairvoyance, Astral Travel, Intuition, Higher Consciousness, Awaken Your Energetic Potential' demystifies the complex science of Kundalini in a compelling content of the power of mantras and complete instructions for their use, breathing techniques for relaxation and stress reduction, and it also contains meditation exercises using the guided imagery that will give benefits for readers and or listeners seeking to find relaxation, harmony, and inner peace. As we all know that Kundalini is a powerful pool of energy that lies dormant at the base of the spine. Also, the kundalini can show us why we are here, what life is really all about and help unveil the mysteries surrounding our everyday lives. This book can teach you to calm your mind, improve your health and develop abilities that most people aren't even aware of. Also this book will provides you proof of the above statement, based on the findings of various faiths and organisations, coupled with the personal experiences of the author. For a beginner or even an intermediate, you cannot ask for clearer, simpler information of this type. But, for the advanced, it is a great reminder of the basics. Very good treatise. This book provides you with a clear understanding about what Kundalini is and how it works, its benefits and significance! This audiobook is awesome. If you are serious about spiritual growth it outlines a meditation plan that can radically change your life. This guidebook will tell you how to use the meditation and Mantra together to achieve the extra ordinary desired results in a short span of time. Gets straight to the point and great techniques to awaken Kundalini within. This explains what the Kundalini is and how it is relevant to a person’s growth and to mankind’s evolution as a whole. It gives clear and practical techniques to safely and effectively activate the potent power source hidden in every person’s spine. This book synthesizes Kundalini research into a handy, easy-to-understand guide. 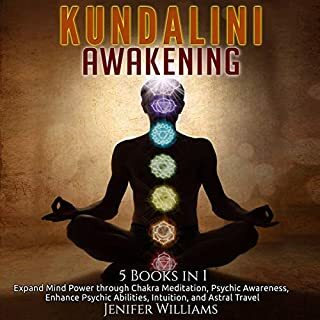 deliver an understanding of what Kundalini is..
What I like about this audiobook is that it deliver an understanding of what Kundalini practice is, plus a brief history and other background information to help you gain a more complete context. This book also includes suggestions on how to start your Kundalini practice in order to heal and empower your body, mind, and spirit. quite helpful and the answer to everything.. I found thisaudio book to be quite helpful and the answer to everything I have been experiencing over the last 3-4 years. I still don't understand why it has happened to me. Being very spiritual and an Intuitive, I decided to finally search many of my books after years of sincere prayers; one day I opened my kindle to a page with only kundalini books and I thought audiobook would be great as well so I got a copy of an audiobook of this. Now if that's not a sign from my guide's, I don't know what is. I bought many, but this one is concise and covers it all! When you enter the world of spirit for the first time, it can be very confusing and you can often find yourself lost in the tangle of unconscious spirituality. 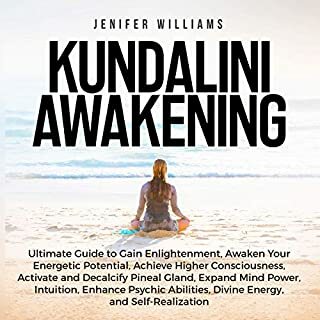 This book by Jenifer, really told me what I needed to know when it comes to Kundalini awakening, it gets straight to the point and great techniques to awaken Kundalini within. Moreover, tons of great information available in this audiobook. Thank you for sharing everything so succinctly!